20 Citronella Wipes. Body protection against insects for the open-air life. 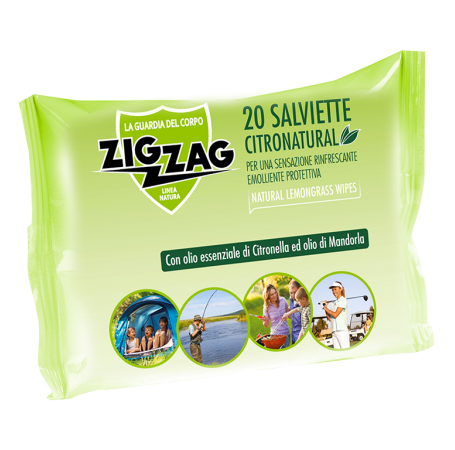 Practical and fluffy wipes that caress skin protect it from annoying mosquitoes and insects. They contain Essential Oils of Citronella and Geranium, for natural protection. Also suitable for children's skins. Respect the environment: It is a natural product that contains no harmful substances for humans and the environment. Lift the adhesive tab and pull out a wipes from the envelope. Pass the wipe on the skin, carefully avoiding areas around your mouth and eyes. Carefully close the package, avoiding the evaporation about the essences contained in the package. Being a natural product, the application should be repeated at least every 2 hours. On uncovered parts of the body. Also suitable for the delicate and sensitive skins of children. Do not apply on scratched skin or wounds. Essential Java Citronella oil has an attractive perfume for humans but it is very unattractive for insects and especially for Mosquitoes which are annoyed by it and avoid it.